It's finally SPRING! The daffodils are blooming, the peonies are pushing their way up through the thawing earth, and the trees are budding forth new foliage! I am so ready!! 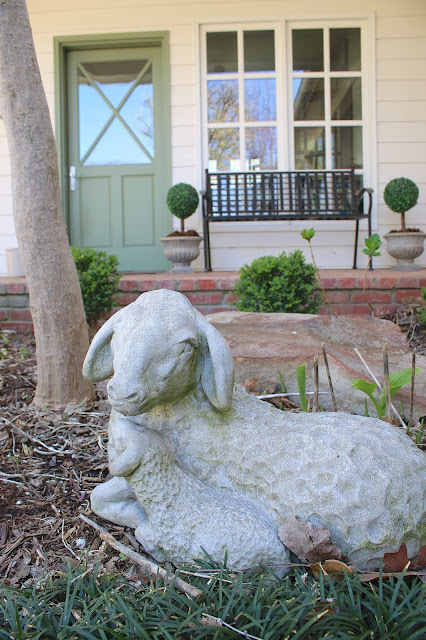 One of the loveliest bloggers in blogland, A Stroll Thru Life, has invited me to join her fabulous Spring Tour of Homes. Click HERE to start the tour from the very beginning. If you are coming via Driven by Decor, welcome! Kris and I met at the beach a couple years ago and she has been a sweet blog friend to me ever since!! You definitely do not want to miss out on her gorgeous home! The Bradford Pears are in full bloom. As the soft white petals gently float to the ground, they cover the greening grass in white. The hydrangeas and hostas are leafing out and will soon fill in with beautiful blooms of pink and blue. The winds will die down in a few weeks, then the flag will go up. In the meantime, daffodils and camilla are fulfilling my craving for color. The porches are ready for their spring bath. It takes a lot of work to get the house cleaned up and ready for spring, but it is so worth it! Fireflies and Bar-B-Q's are just around the corner! Can you smell the hyacinth in the air? Mmmmmmm. The entryway will receive a fresh coat of paint soon, but I've been moving things around and brightening it up in the meantime! Carnations in one color are some of my favorite flowers. They smell like spice and the blooms last forever. They even dry into pretty ruffles, so I snip the dried blooms and place them in a silver bowl. 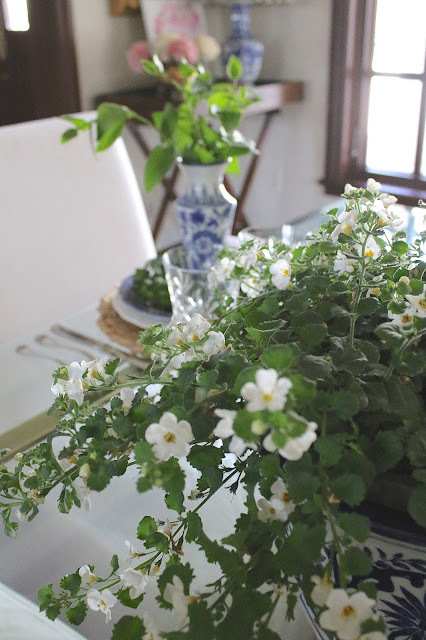 My Spring table is inspired by the garden! 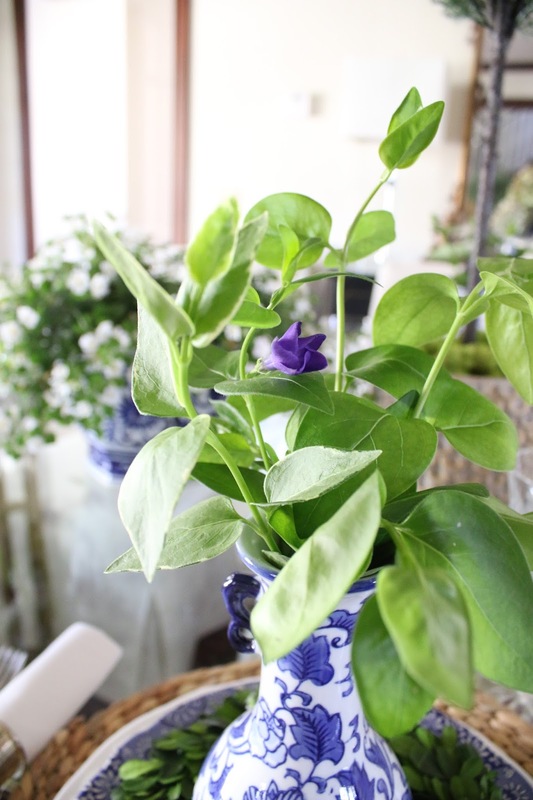 I snipped Vinca from the flowerbeds and placed it in blue and white vases at each setting. 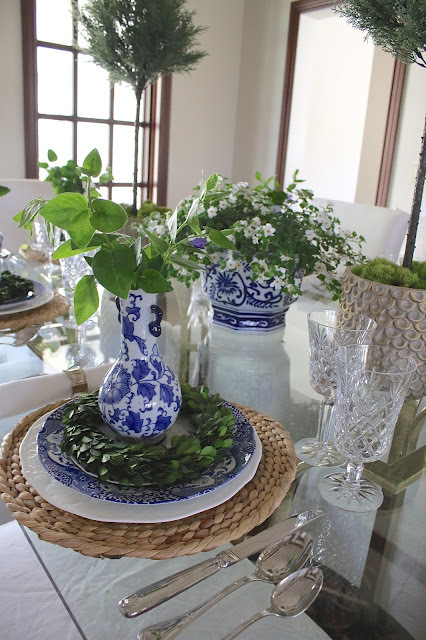 Blue and White with fresh greens is my go-to on a budget. I try and grow things in my landscape that I can easily snip and bring indoors. If that isn't possible, I have been known to ask neighbors for a bloom or two. 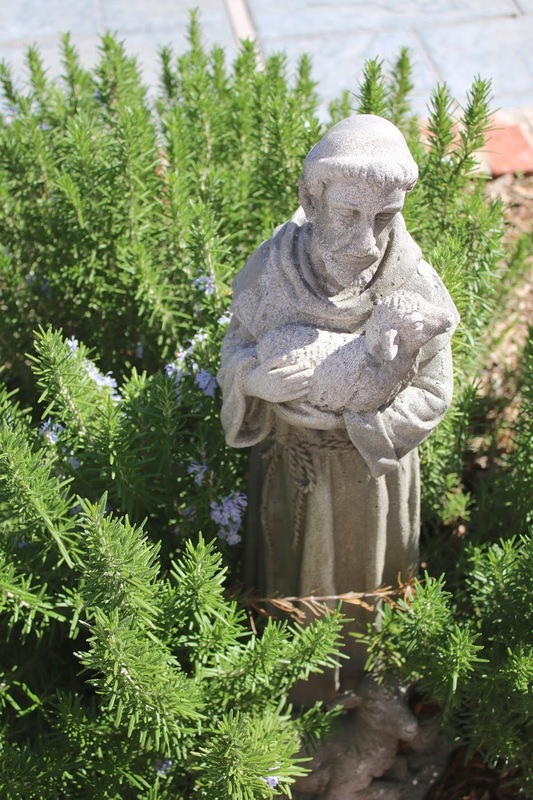 When dividing perennials, I often check with neighbors to see if they want a few "starts." I love seeing my daisies and lilies all over the neighborhood. You know, this Vinca will most likely root and I can share it with my neighbors too! Fresh slipcovered dining chairs lighten up the room and give it a Spring Clean look! A simple hanging pot of Bacopa purchased at Lowes. I removed the hanging hardware and plopped it into a blue and white planter. Instant, inexpensive centerpiece that can later be transplanted into the garden. 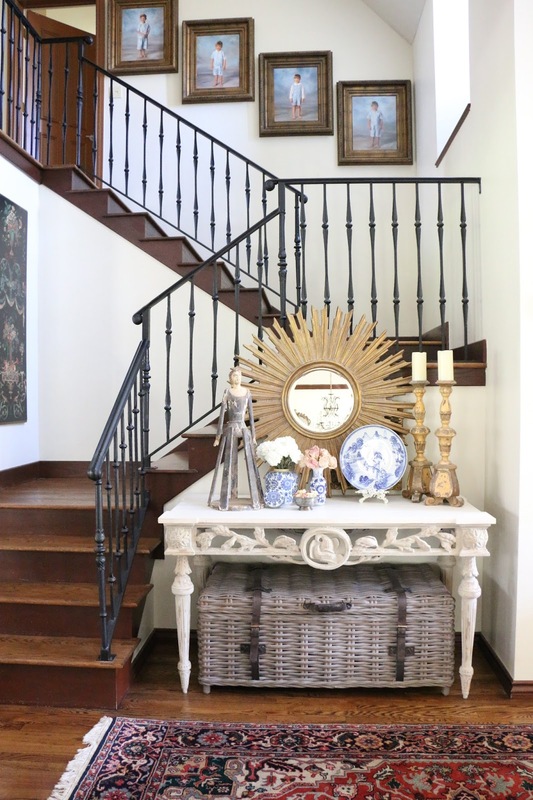 One of my favorite aspects of our home is found in the mix... high end/low end, faux/real, new/antique. The dining room is in the center of the house and gets the least amount of light. 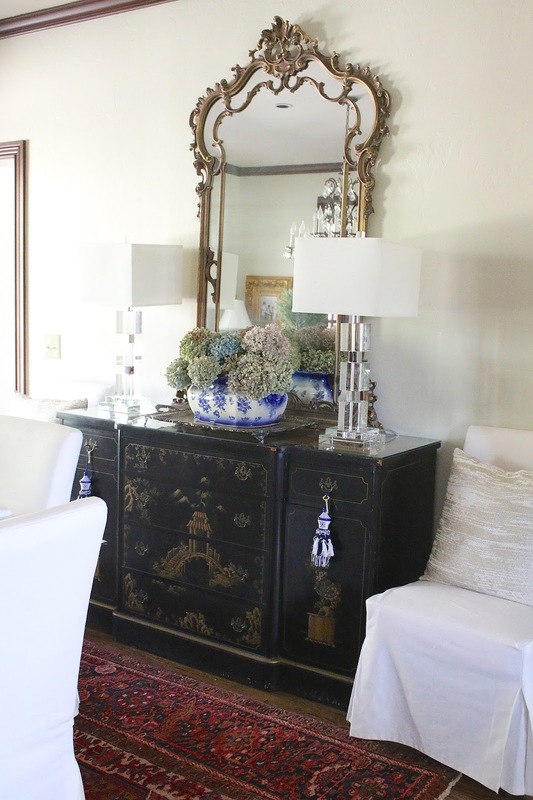 The addition of this large antique mirror reflects the light and opens the room up. The hydrangeas are from last years blooms. They always dry so beautifully. I snip the blooms before the last freeze then use them until I have fresh blooms again. Let's just take one last look at all this dark woodwork, shall we? Hopefully my painter isn't too far behind and can get to me soon! This faux floral centerpiece worked like a charm all winter. Now that spring is here, roses and peonies are not far behind. I will put away the faux and snip a few blooms from the garden every few days to sprinkle around the house. 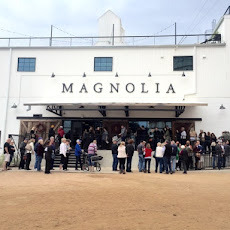 Ahhhhh... the doors are open and springtime is filling the air! There is still a chill in the air, so blankets are at the ready! I love to be able to reach for a blanket easily when I feel cold, so I leave them out strategically. It helps to purchase colors that blend nicely with your decor. The rosemary is blooming around St. Francis. Hosta and Hydrangea are just beginning to leaf out and will soon completely tuck this little Easter lamb away in its' foliage. 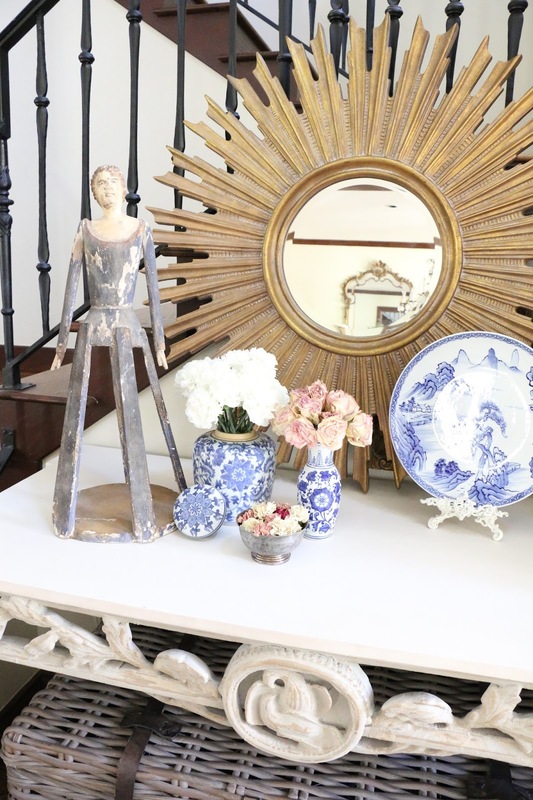 Thank you so much for joining me on this little tour of my entry, dining, and living room. I will be back later this week showing you my kitchen and keeping room. Then, in two weeks, I will show you my porches all ready for spring! 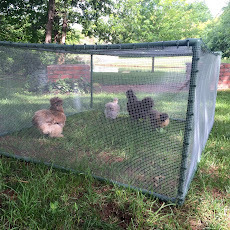 Now, you must go visit my blogging friend, Kristin Bliss @ Home and see how she sprinkles Spring into her STUNNING home! 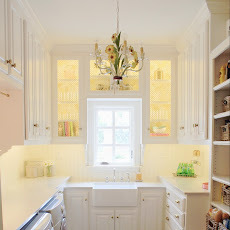 She just remodeled her kitchen and it is breathtaking!! 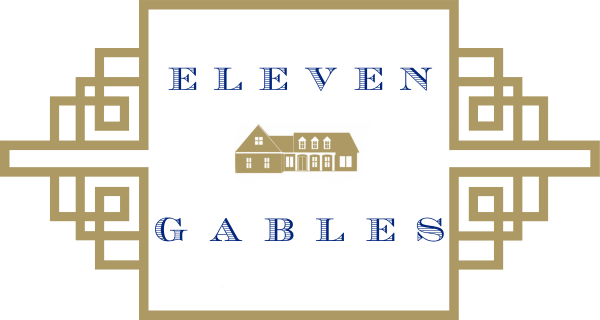 Your home is an estate, a regal estate! It's just so so stunning! Love your spring table setting too. Beautiful! Love your lovely table setting and all your blue and white! Absolutely stunning. I love your home, so beautiful. 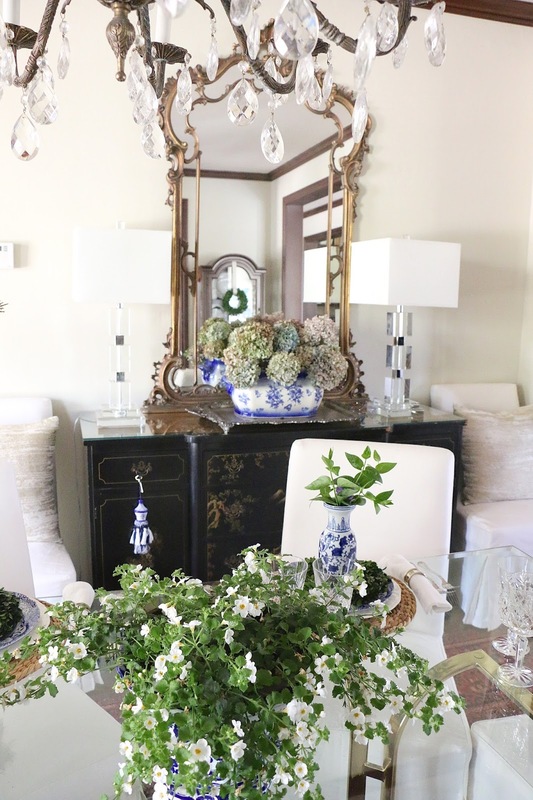 The vases of flowers and greenery in the dining room are so perfect for spring. Such a pretty idea. Thanks so much for joining the tours. 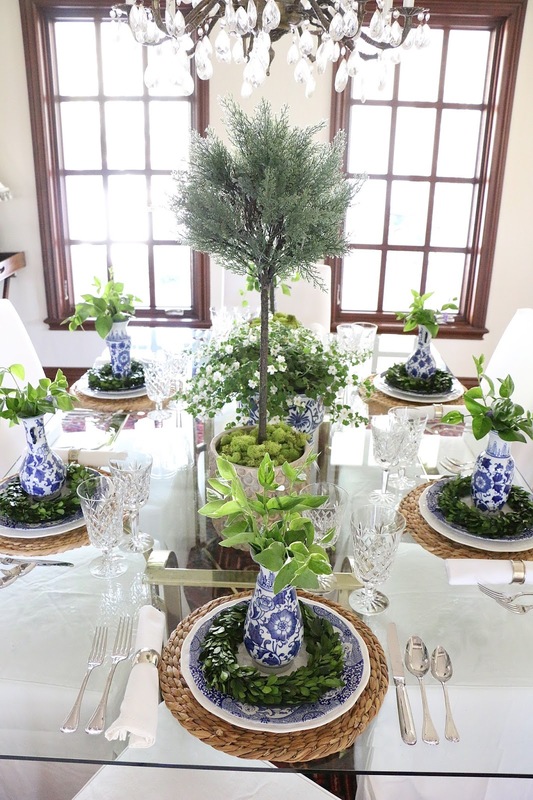 The blue and white decor paired with spring green is pure perfection! Emily you have a gorgeous home! OMGosh I love how you carried the blue and white theme through your rooms. Such a classic combination and always so fresh looking. 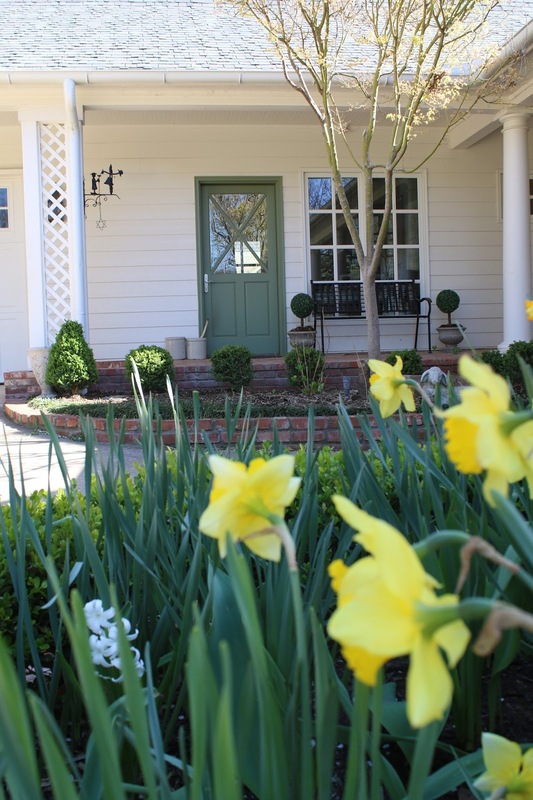 Beautiful spring home tour!!! The outside of your home slays me every time - love seeing all those signs of spring (and hoping they get to me too sometime soon!). And your new couch? Swoon!!! I hope Spring is right around the corner from you!! Please come over and sit on the sofa with me... We can sip chardonnay!! Emily your home looks so pretty for spring! I love all your white slipcovered furniture - the dining room chairs and your new couch - so light and bright! shut up! your spring table is stunning! i love the vases in blue and white at each setting!!! Oh Cassie! You are too kind! It was the easiest thing I could find since I didn't have time to run to town for flowers. Ha!! sometimes simple turns out just perfect. Thank you!! Are you moving? Maybe you should just move to Oklahoma and be my neighbor!! Emily, what a fabulous home you have! I am loving your tablescape especially, and the wood windows and trim. So jealous of your windows!! Thank you so much, Anita! The new windows have been such a wonderful, beautiful blessing after a horrific hail storm in 2013 obliterated the exterior of our home. "beauty from (hail) ashes"
What a beautiful home you have. I enjoyed the tour. Your table design is wonderful. Love the natural greens you added and the overall garden like appearance of it. I love all the handsome wood trim your home has. Your fireplace and surround is a beauty! Isn't it wonderful to see the trees blooming and spring bulbs popping out! You obviously live in a warmer area than me! Thank you so much, Liz! We are in Oklahoma. Not typically this warm in March but I will take it!! LOVE all the crisp blue and white! Can you tell me the fabric on the pillows on your new sofa? Love it!!! 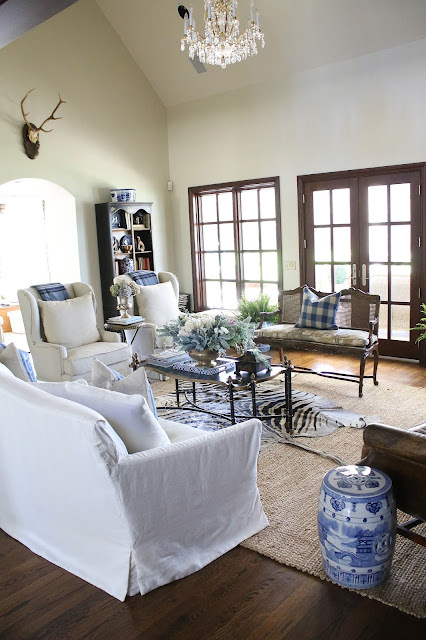 Your home is gorgeous Emily and I love the dark floors, crisp white slipcovers and blues. Just beautiful! Absolutely gorgeous, Emily! I am in so in love with your dining room. Breathtaking beautiful, exquisite in every detail. Thank you so very much for sharing your lovely home tour with us on Thoughts Of Home On Thursday! We hope you will join us again! You have such a beautiful home, Emily! But last year's hydrangeas and the blue and white took it to another level! Happy Easter! You have a beautiful home! I actually love the dark woodwork--it really sets your home apart. Happy Easter! Emily, I was so excited to see this pop up on Thoughts of Home on Thursday. I'm following you on Instagram. We lived in Oklahoma for 23 years and just moved back to Texas almost 4 years ago. Love that state. We are thrilled to have you. Shared on Facebook. Very pretty...so fresh, light and airy! I love the dark wood as an accent. I just love Bacopa and could not for the life of me remember the name since last year! I am so happy to see it here so I can look for it and fill my buckets this Spring. It lasted in my container garden until the end of November. I got the lavender one at Lowe's last year. You are so talented Emily! You have such a fresh classic, clean, beautiful style. I need to know everything. Where did you buy the sofa? Love that. You can text me the info LOL. Are you painting all your woodwork white like I think? The blue and white patterns and colors really go well with the green! Just stunning! Your home is so lovely and while it's clean and fresh it still feels cozy. Love it!